Asopao de Pollo is a popular Dominican and Puerto Rican dish. It’s essentially our version of a Chicken and Rice Soup that infuses all of our favorite flavors. It’s the dish that keeps on giving because you seriously feed an entire village with just cups of rice! And remember, we’re talking about rice jambalaya type soup so you know it’s going to be filling! Every family has their secret recipe on how to make Asopao de Pollo. Some insists that it be spicy and soupy while others love it thick and filled with chicken. 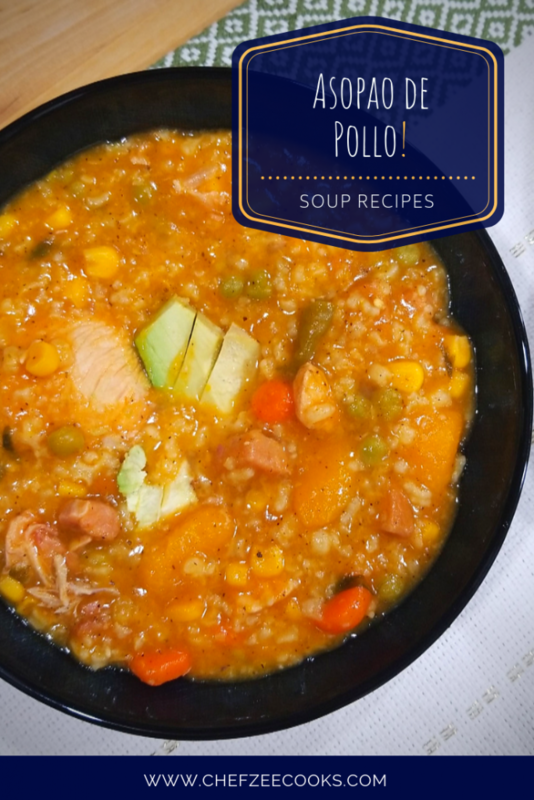 I personally love it the way that my grandmother made it with smoked pork chops and auyama which gives this Asopao de Pollo a subtle smokiness and sweetness. It’s perfectly balanced especially with perfectly ripe avocados on the side, lime, and hot sauce. I remember being a greedy child ready to dive into the Asopao only to burn the roof of my mouth! It was then that I learned, good things are worth waiting for! Winter time immediately puts certain dishes in heavy rotation. Sancocho, Avena, and Asopao. 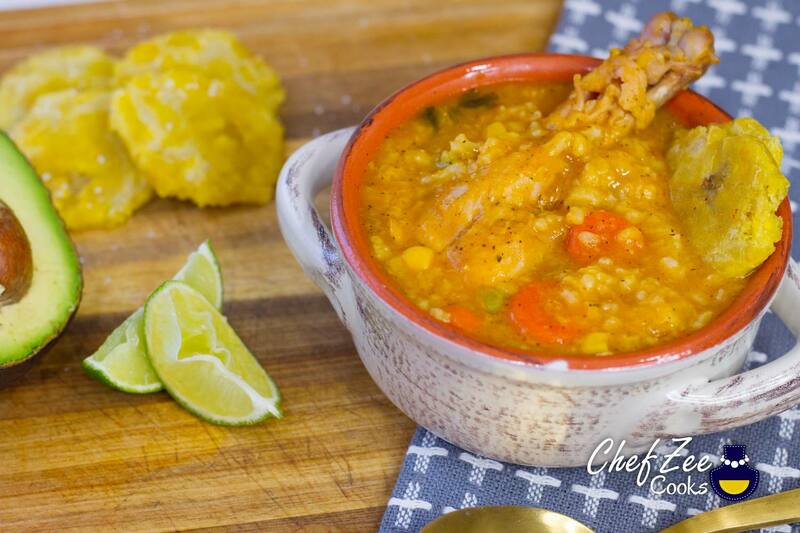 Asopao de Pollo is a staple during the wintertime or anytime a large crowd unexpectedly arrives at your house. Just this past year, my fiance’s family brought back parranda which is when you show up at midnight singing Christmas Carols. The host of the house is typically caught off guard and woken from their slumber to a crowd of cheerful family members. This year, we ventured off to 3 parrandas– all of whom were aunts and uncles of my fiance. The feast that they made to feed the singing carolers? … You guessed it — Asopao de Pollo. Asopao de Pollo comes together really quickly. It’s also a dish that you probably have all of the ingredients for but you probably don’t even realize. My fiance’s aunts are all parranda pros, so Asopao de Pollo is usually their go-to. You season the chicken with some staple Dominican seasoning like sour oranges or lime, garlic, adobo or chicken bouillon cube and Dominican Orégano. For the soup, you celery, onions, and carrots. You can then choose to add auyama (kabocha squash) or sazón for color along with tomato paste. There’s no question that you definitely need fresh cilantro to bring this all together. The fresh herbs brings together this dish. More importantly, you need a really big pot. Asopao de Pollo, just like its cousin Asopao de Camarones has the tendency to multiply and grow. In fact, one the very first times that I made Asopao de Pollo was a funny disaster. I started off by eyeballing everything. I didn’t quite understand the nature of this dish or understand that this dish is famous for feeding a village. It’s budget friendly because a tiny bit of rice and chicken produces a hearty. Unknowingly, I seasoned POUNDS of chicken and then added 3 cups of white rice. The crazy part? I was doing all of this in my 5qt Dutch Oven and not my Sancocho Pot. Hint: The Sancocho Pot is the infamous pot in every Hispanic household that can feed 25 or more people! Fast forward to my Asopao growing out of control and me making a huge mess. Lesson learned. Do keep an eye on your Asopao. It has the tendency to grow and it also has the tendency to stick to the bottom of the pot. Now while I love con-con, the crispy golden burnt delight is best when making regular rice, not Asopao. Smoked pork chops are optional. I love the flavor or smoked pork chops in Asopao and in Sancocho, however, this doesn’t really jive with everyone. Feel free to omit. Your Asopao will be AMAZING! There are a few ways to color your Asopao. You can choose to use Auyama- Kabocha Squash or you can use the Sazón Packets. You can also rely entirely on the tomato paste. The choice is entirely up to you. Just make sure not to be too heavy handed with tomato paste or else you’ll end up with a tomato and rice soup. Add water when reheating the Asopao. Like many soups and stews that I feature on my YouTube Channel: Chef Zee Cooks and blog, soups and stews tend to thicken as they cool. When reheating this dish, add water and adjust any seasoning if needed. Hot water is your friend! When making Asopao de Camarones, I insisted on always having a hot pot of shrimp stock ready to go. As the Asopao thickens, it will also dry out thus needing more water. It’s best that the water that you add be hot so that it doesn’t shock the rice and slow down the cooking process.